During the last week of May I visited Sheridan College in Oakville, Ontario to watch the magic that is puppets. Jane Edmondson, the project’s wardrobe designer and line producer, made a deal to get to Sheridan’s beautiful green screen studio. As part of the deal Edmondson, having taught in the Special VFX Program, arranged for her students to work on set. Primary filming took place over five days, and each day starts with cast, crew, and interns alike stopping off in the make-up room. Like the brightly lit make-up rooms of my childhood the space fills up quickly. Props and puppets cover every table. The interns, Sheridan College students, work along a row of mirrors applying make up to every puppeteer/actor. I store my things in the corner of the room, hoping to not take up essential space. Robert Mills comes in, and in the middle of greeting me bursts into laughter. I happened to be standing beside a puppet pig in a fez. Ruffus The Dog is an ongoing children’s web series created by Robert Mills. 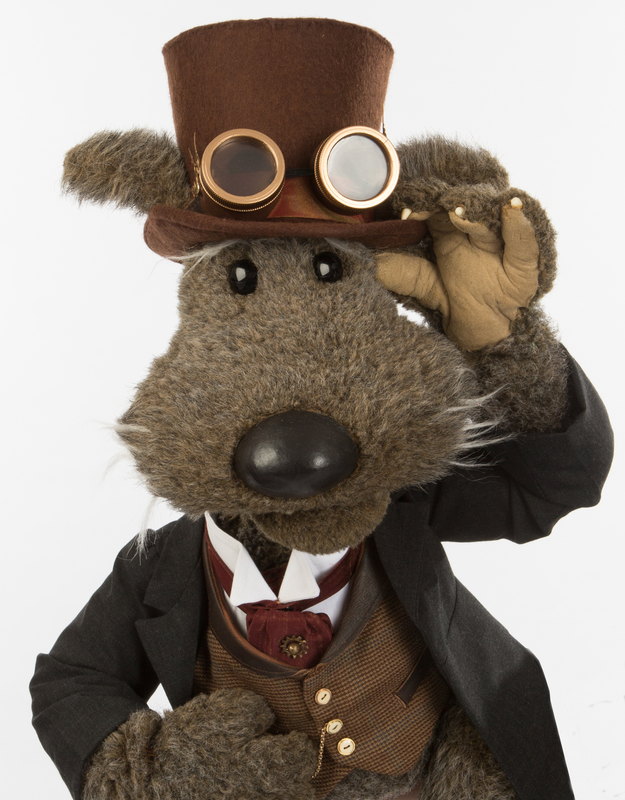 Mills’s steampunk version of Ruffus started out as the second installation of a special episode. The first Ruffus special was Ruffus the Dog’s Christmas Carol, and has a longer runtime than the typical 15-minute episodes. The Ruffus Christmas special has a runtime of about 37 minutes. Now Mills hopes to launch this steampunk project into a whole new series for Ruffus. The new series is complete with non-puppet characters as well, a first for Ruffus. This includes a few badass female characters, including the female lead played by Alyson Court, and The Three Graces. 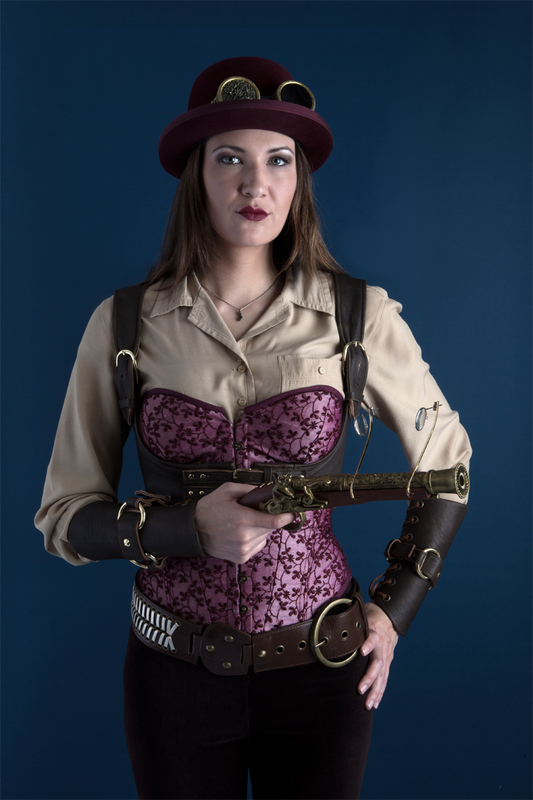 All of these steampunk women are featured as women of action. Court runs along rooftops with Ruffus in a Victorian-style dress, and The Three Graces make an entrance that requires a large fan. On June 5, 2013 Mills while filming pick-ups with Ash Catherwood, shows me his a preview of his edit of the trailer thus far. Taking the shot of The Three Graces he filmed just the week before, and adding music and steam. The slow-motion entrance makes for the ultimate all-women steampunk entourage. On the same monitor Mills pulls up what he had of the steampunk blimp, a sample of the entirely CGI set. In the room upstairs, Catherwood prepares to film his scenes as a mad scientist. Catherwood dons a white lab coat, industrial black gloves, and a pair of steampunk-a-fied goggles. The goggles covers about half of Catherwood’s face, an element that only makes his evil laughter all the more comical. The story between Ruffus Steampunk, Ruffus Christmas Carol, and the regular Ruffus episodes may vary but for Mills the message is still the same. His continuous goal is to promote literacy to kids, and probably why Ruffus lives in a bookstore. It’s also one of the big reasons why Mills makes all of his Ruffus material available for free online. 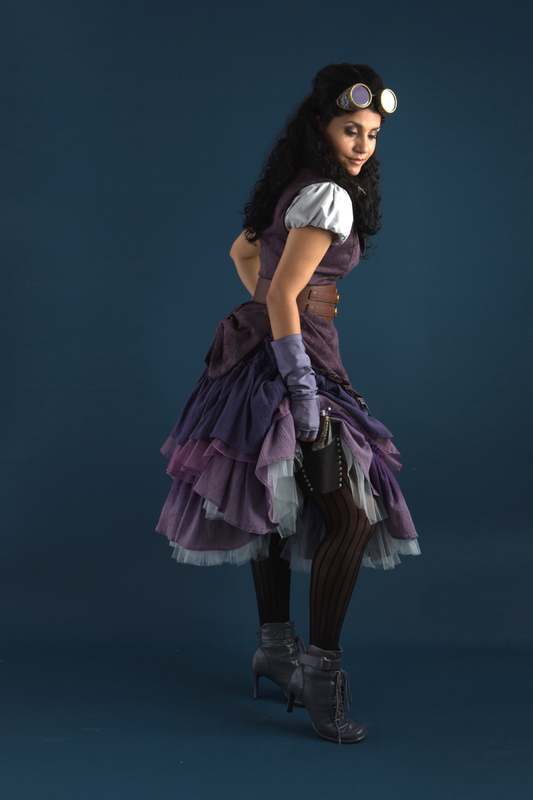 Steampunk might seem a little ways off from promoting literacy to kids, with all of the gears, goggles, Victorian garb, and leather corsets. But it’s also about freedom of information, something that Mills feels strongly about, and why he’s big player in Toronto’s web series scene. Robert Mills is the acting president of the Independent Webseries Creators of Canada, or the IWCC. His web series project, Ruffus the Dog, received quite a lot of positive feedback with a booth at Fan Expo 2013. The Press Pass will continue to update with highlights of Robert Mills, Fred Stinson, Alyson Court, and Jane Edmondson at Fan Expo.